LEISD Parent/Teacher Association – everychild.onevoice. 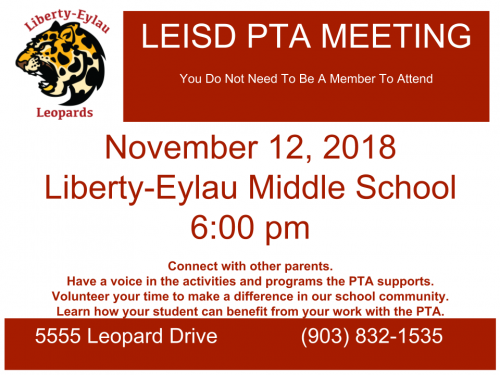 Interested in joining your local LEISD PTA??? The cost is just $10.00. Please CLICK HERE to leave your contact information and a local member will be in contact with you soon. PTA Arts in Education – Heroes Around Me is the theme. All entries due by November 16th. Commitment: We are dedicated to children’s educational success, health, and well-being through strong family and community engagement while remaining accountable to the principles upon which the Texas PTA association was founded.